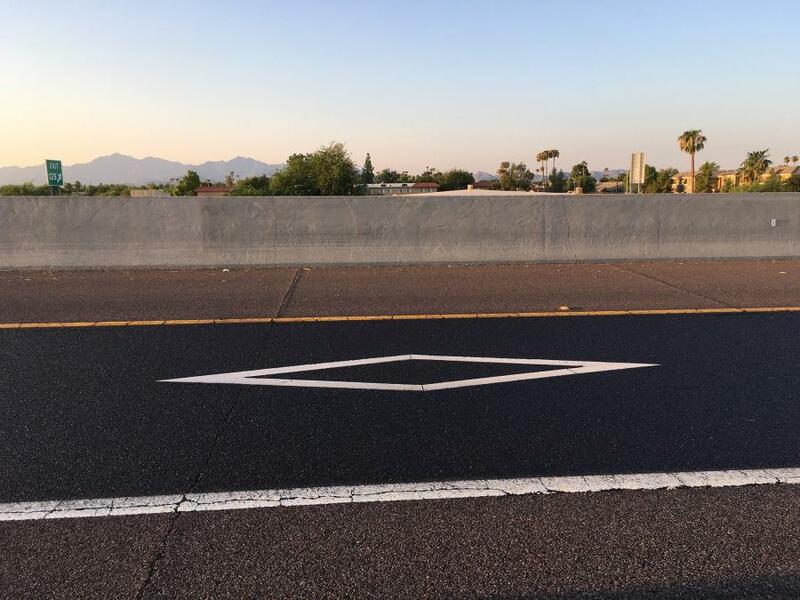 Using scrap metal, ADOT maintenance workers fashioned what’s essentially a reverse stencil — a diamond-shaped template that keeps the oil-based seal off of white HOV markings within lanes. After asphalt lanes get a rejuvenating seal designed to reduce cracking and extend the life of pavement, an innovation by Arizona Department of Transportation employees allows crews to reopen freeways faster. Using scrap metal, ADOT maintenance workers fashioned what's essentially a reverse stencil — a diamond-shaped template that keeps the oil-based seal off of white HOV markings within lanes. They also designed a metal arm to lift and transport the template from one HOV diamond to the next. While applying the seal doesn't affect lane striping, HOV markers within lanes once had to be repainted before a freeway could reopen. In addition to shortening the full closures required to apply the seal, saving the time and money needed to repaint HOV markings adds up to $310 for each diamond. According to Mark Kilian, an ADOT highway operations technical supervisor, using the reverse stencil usually involves two trucks, each transporting and placing one template. This process improvement, he said, is designed to better serve drivers, who are ADOT's customers. “We had a major interstate shut down, and we wanted to make sure we can get it open as soon as possible, so we have to be as efficient as possible,” Kilian said. This innovation is another example of ADOT's commitment to continuous improvement through the Arizona Management System (AMS) championed by Gov. Doug Ducey. AMS challenges all employees to identify and develop ways to deliver more value for taxpayers. For more information, visit azdot.gov.